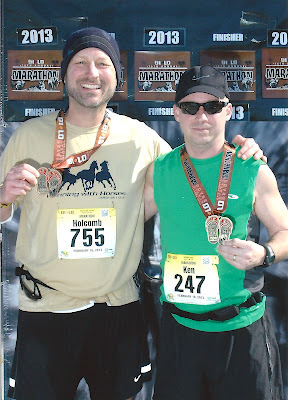 Running With Horses: Myrtle Beach Marathon 2013 - Teamwork! 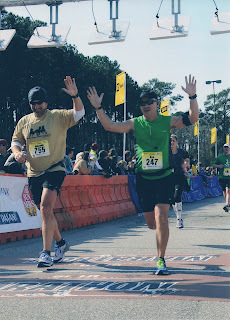 Myrtle Beach Marathon 2013 - Teamwork! Running Myrtle Beach had the feeling of coming full circle to an event that I had originally planned to run in early 2006 (at last the half marathon was the plan then). However, an expedited relocation to California a few months prior, required that I cancel those plans. Now, here I was. 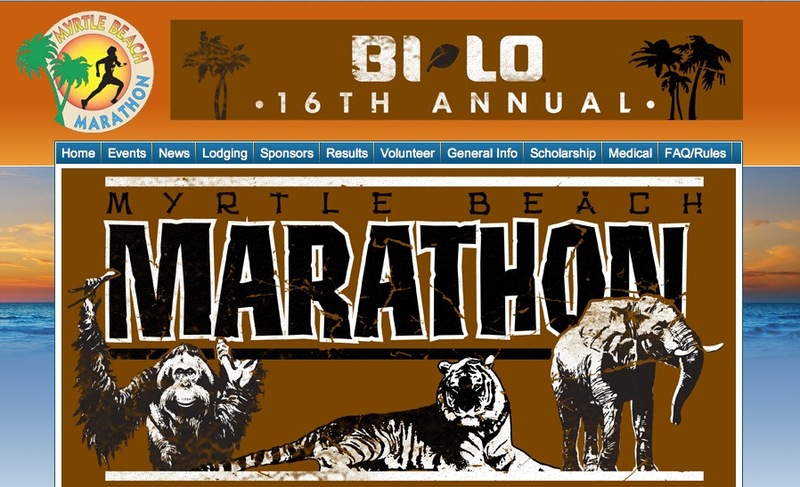 Not only ready to run the popular beach front marathon, but running it with my good buddy Ken, in his first 26.2 attempt. Ken and his wife Lindsay were special friends of ours from the Florence, SC days. They caught the running bug a few years ago and have been tearing it up ever since. Before commenting on how the race actually played out, I'll provide my usual list of observations, thoughts and feedback on the event itself. 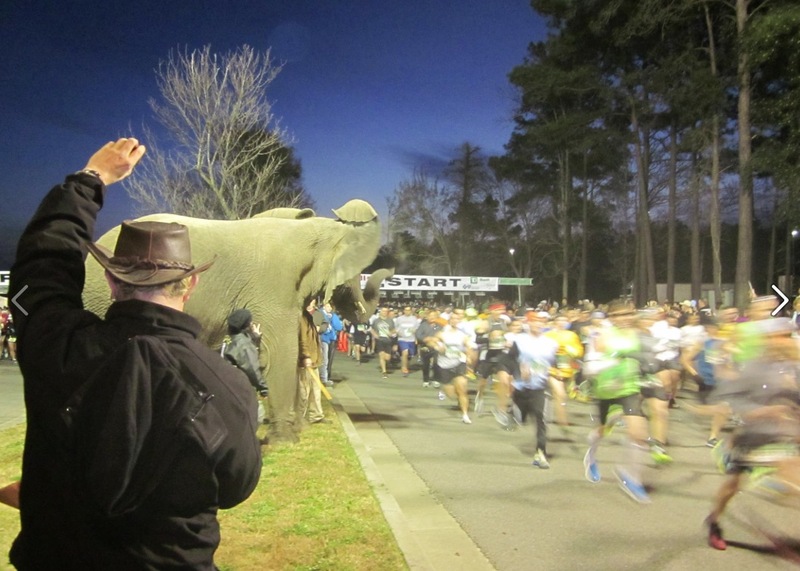 For an above average size race, between 8-10,000 runners in two distances, the overall atmosphere felt much smaller. 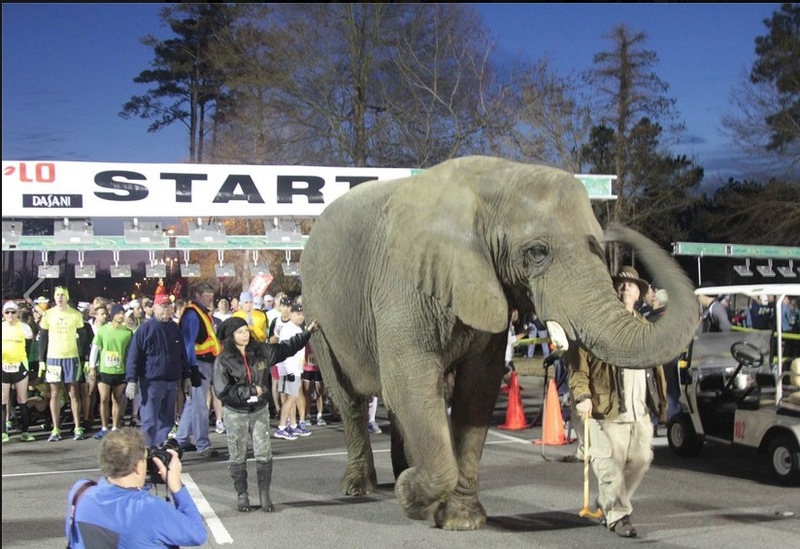 This was perfect for getting through the expo and maneuvering around the start / finish areas, but the organization also felt like a small race. This is not a slam, just an observation. Some specifics are found below. 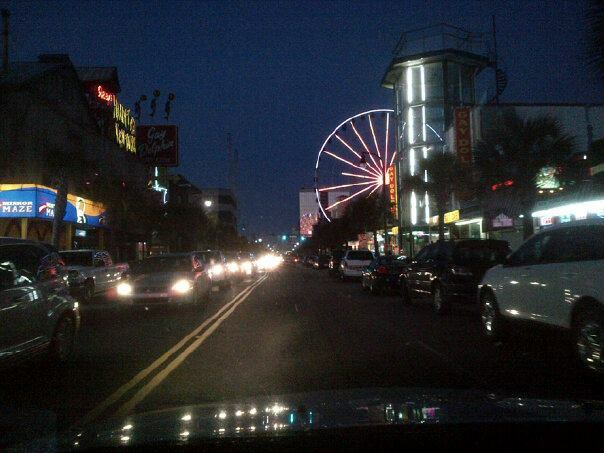 Parking at Broadway at the Beach was excellent. 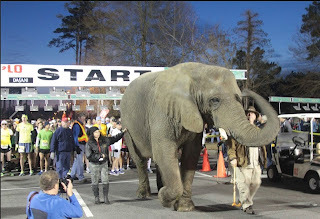 I was within 100 yards of the starting line, and only a couple 100 yards from the finish. This made it easy to get to my vehicle following the race and I could hang out in the warm confines of my rental car (with Sirius and E Street Radio no less) up until the final pre-race moments. Having gone the way of shuttles and subways for the past few marathons, parking nearby was nice. The weather was excellent. Myrtle Beach is known for being a "take your chances" race. Usually this is due to wind off the ocean and often bitter cold temps. We started in the high 30's and came in around 48. Could have used a little more sunshine, but no complaints. The course is promoted as flat, and comparatively speaking it is flat. 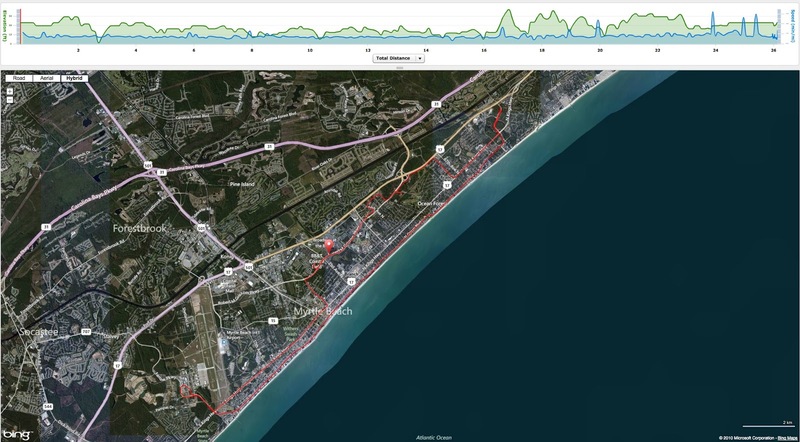 But don't be fooled, there are several rolling sections along Ocean Blvd and throughout North Myrtle Beach. I would say that Chicago was much flatter than Myrtle, but it is definitely a top 5 run for the hill-challenged like myself. The finish area was a bit frustrating. 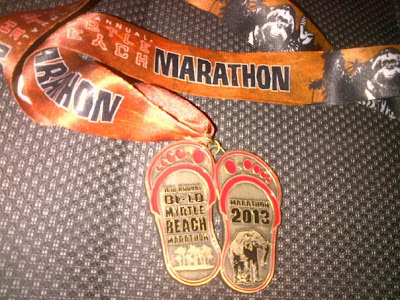 Once you crossed and received your medal, the next item provided was a store bought poncho in a clear package. This was to serve as your Mylar heat blanket. No such luck. Unfortunately, a more traditional blanket would have served us well on this crisp morning. More frustrating was the lack of direction to the hydration and nutrition area. Having eventually been pointed to the area by other runners, we arrived and there was plenty of good choices, including chocolate milk and warm soup! 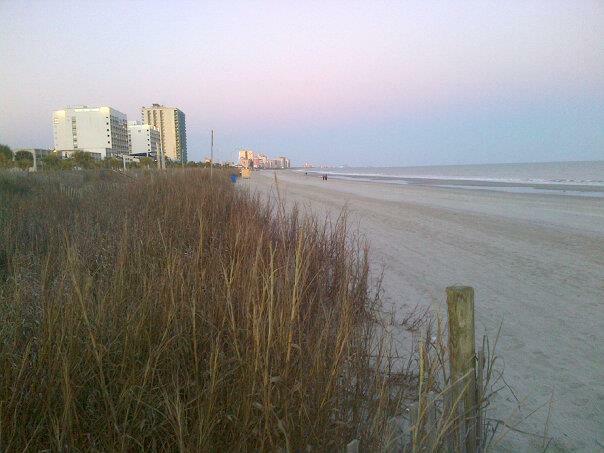 So, as an event, I would give Myrtle Beach a 3.5 / 5. Not great, but a solid good. 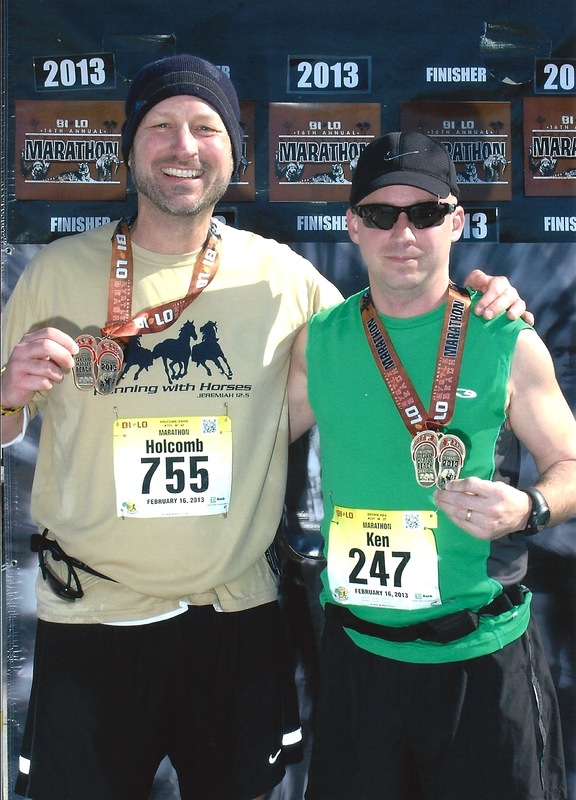 But as the ol' MasterCard commercial goes, running with a partner was priceless. A solid 5 / 5. And speaking of running, back to the race. I knew from our start that the key to bringing us home under 4 hours would be to try and hold Ken back. I call him the Florence Flash and he is a speedster. 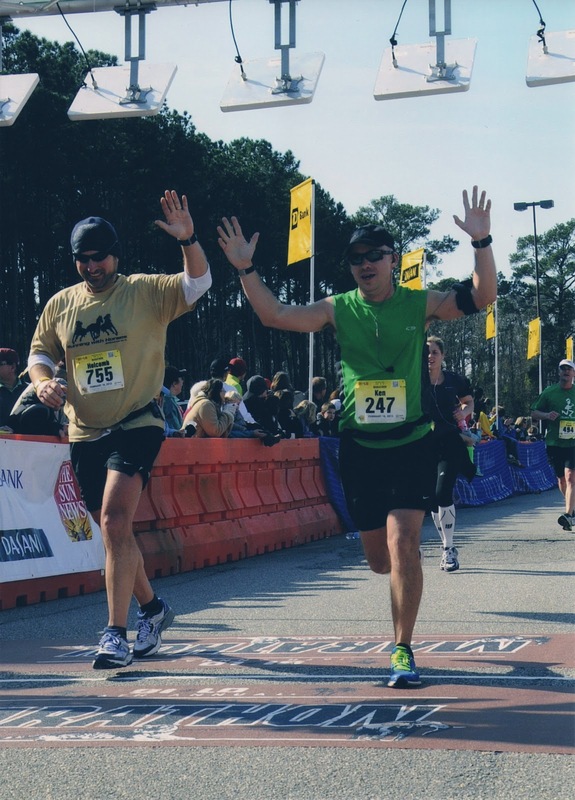 I insisted that we pace 9:05 miles for the first half of the race. We were fairly successful at that and came in with a 1:57 half. We were both feeling good and we started to push a little more (this was a mistake). Under normal preparation and race ready conditions, I would not have thought twice about picking up the pace at this point. But we had not prepared normally at all. When we turned a few 8:30 miles at mid-race, I kept thinking we might be in trouble. I started pulling back a little more forcefully. Then we hit what I always call the midpoint of the race, mile 20. I was hurting. My thighs were pounding pretty good and I started to worry some. Our miles really slowed towards mid 9:00's and even some slower 10:00's as we made our way through aid stations and downed a few more salt tablets. (NOTE: this was my first attempt at using salt tablets during the race. The result is that this was my first marathon to not experience any form of leg cramps in the final miles. Hmmm, maybe I'm on to something). Hitting miles 22-24, Ken was looking strong and became an encourager that I truly needed on this day. I began insisting that he continue on at pace and finish strong, I would eventually make it home. Ken would have none of it. I recall saying that I just didn't know if I had it in me today to stay running. Ken looked over and said, "Come on Dave, run with horses man, run with horses!" Well, what was I going to do then. We kept running. Never so happy to see that line! I have only really "hit the wall" once prior. A hot day in the Pocono Mountains whipped me good and I still staggered home at just a few minutes over 4 hours. Other than that, I've never really felt a wall. On this day, I experienced not only "the wall", but amazingly somewhere just shy of mile 25 I felt a renewal and a surge. Like breaking through the wall. I started picking the pace back up and felt like I could almost sprint home. Then I saw Ken grimacing a bit. His calves were going on strike. Some stretching on the curb, a few more yards, some more stretching. We were close, but yet so far. 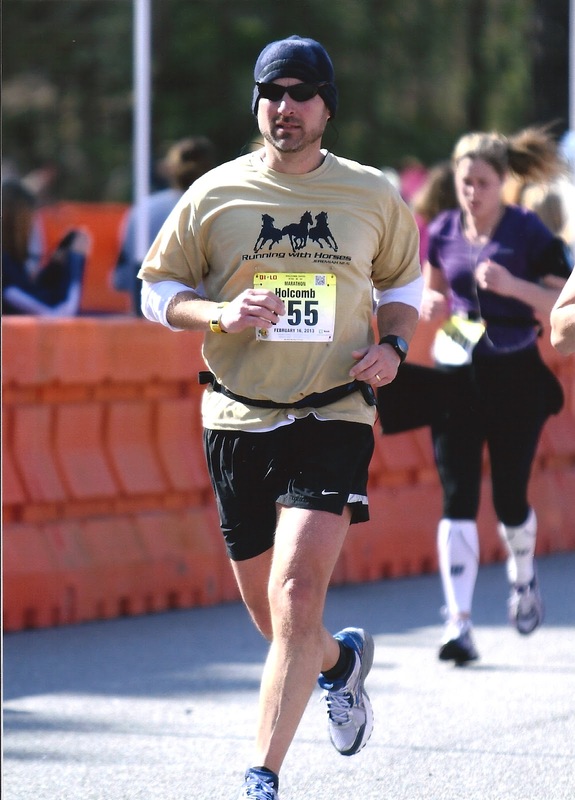 Ultimately, Ken fought through the calf cramps in the final mile and we crossed the line at 3:57:14! What a great feeling. We fought it out together. Pacing one another. Encouraging one another. Pushing one another (although I think he ended up pushing me a lot more than I did him). I really needed that. I had such a horrible feeling late in the race that I was keeping Ken from getting that goal time. He just kept saying, "all I wanted to do was finish, I don't need to come in under 4." Then he would look at his watch and say, "but I still think we can, come on, let's do this thing!" Number six on my journey to fifty is in the books. I am learning that every one of them will require something different and I will learn more about myself with each cycle of training and crossed finish line. This was a special one. It wasn't a PR. It wasn't an awesome crowd and course. It wasn't the best shape I've ever been in. But it was a shared experience, requiring an all-out effort and collective strength. Something about the whole is greater than the sum of it's parts. Thank you Flash, can't wait to hear about your next one! 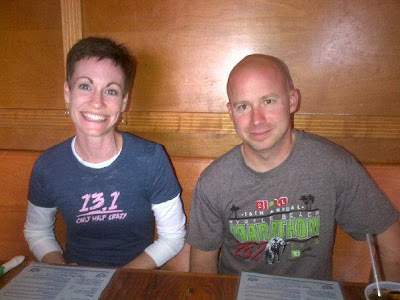 Post-race glow from the Browns. A big burger and a race recap. 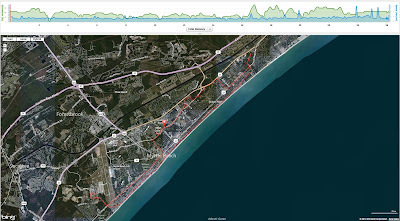 For those familiar with Myrtle Beach, you can see that we began at Broadway and finished at Pelican Stadium. You can click on images for larger view.